Guerrero is one of my favourite tracks.. love a slow and sassy cha cha.. but unlike a lot of songs.. it’s not filled with two dimensional lyrics, but depth.. questioning your part in changing society and engaging with your apathy towards poverty and social ills. I am gutted that the time La Excelencia is back in the UK finally in a couple weeks, I have to be in the US for a bit for work! So rubbish! I have followed these guys for awhile and yesterday very happily my mailbox presented me with their third cd.. just released this month! 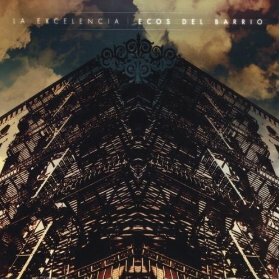 Ecos del Barrio is brilliant. I am still wrestling with trying to decide a favourite track and think I am just going to have to give up because sometimes the best albums don’t have one track that stands out above the rest because there are so many great ones. Songs that make you think and things that need to be said. (And if you don’t speak mediocre Spanish like me you can just google translate and kinda get the gist, though it’s much better in the Spanish!) If you’re my people in the UK.. get to this gig in Leeds in a couple weeks. Lubi’s throwing a party and they’re gonna star and it’ll be excellent (hearing my South African friends “exillint” accent in my head just there) . 🙂 Also.. though I’ve only met a few of them once, or maybe twice, they’re awesome and just cool down to earth guys that I enjoyed hanging out with after the show I caught in Scotland a few years back.